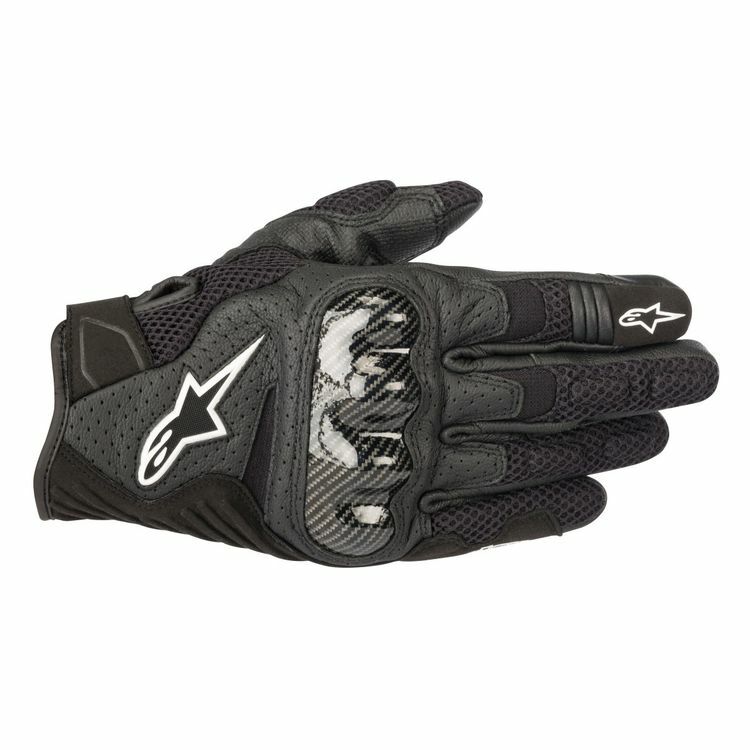 The Alpinestars SMX-1 Air V2 Gloves continue in the tradition of protective short cuff gloves that flow tons of air for hot weather riding. The latest version uses a new chassis with a redesigned cuff closure, padded fingers and strategically placed stretch material. The V2 glove combines perforated leather and heavy duty mesh to create a glove that breathes well during hot weather while still providing basic motorcycle protection. Synthetic suede at the palm and sides of the glove provide reinforcement against abrasion as well as regular wear and tear. These gloves are true to fit and comfortable. Good quality gloves! Run small. Seem like a great quality glove but I ordered a large because I tried on a similar model alpinestars pair and they fit fine but when I got these they were snug and where the stitching was made my hands hurt not long after putting them on and didn’t seem like breaking them in would help. I returned with no problem and am waiting on the XL now ! I normally wear L or XL gloves, and according to the sizing chart, which I used talors tape for reference, XL should have been perfect. So far they are very tight and difficult to ride safely with. I've been wearing them around the house trying to break them in and hoping they'll loosen up. Finger lengths are fine, and identical to a pair of Taichi gloves in XL, but my Taichi gloves fit WAY more comfortably around the hand. Unfortunately they're pretty tore up from age and abuse, or I'd continue wearing them. The gloves look fantastic and I dig the design overall, but I don't like how tight they are. If they don't break in and loosen up they'll be useless to me. I do not want to get XXL because the finger lengths will be longer and that's annoying as well. These are still very new, so that is why I deducted some marks. They are well made and appear as though they will last with the reinforcement and stitching. The gloves are a bit tight but I am still wearing them in and the comfort does rise the more I wear them. Excellent airflow and finger movement. I bought and returned the Large pair, bought XL and still they are too tight. I'm hoping they will break in more. It's hard to make a fist in these even with a size larger than the sizing guide recommended for me. I'd recommend almost 2 sizes larger. Before you assume I didnt measure myself right. I had tailors tape. I paid attention to exactly where the sizing guide tells you to measure from. I have purchased icon gloves with the same method before (from revzilla) and they were fine. The main problem I have is the fingers bunch up when you squeeze your hand giving more resistance than I feel like should be necessary. It makes fine control inputs a total pain. I would recommend you go a size up from what it says. I really enjoy the style style of the glove Oman’s the price makes it definitely worth the money, if you ride a sports bike it goes well. I bought these gloves for the warmer weather of course and they work pretty good. When I first tried them on they were tight as hell but after only a few days of riding they stretched and broke in. I’ve had these gloves on in 30 degree weather as well and they still kept my hands warmer than I thought. These gloves are great if your looking on a budget. Got these on sale. Great gloves for the price. Not sure if they would be worth it at full price. This is what all gloves should feel like. One of the most comfortable gloves I have ever worn. They have improved the mesh on the fingers so they don’t snag on the Velcro as bad as the previous version. These will be my hot weather gloves this season. The tactile feel of the controls through these gloves are great. Great job Alpinestars.